Trinity undergraduate students interested in conducting research in the Pitt Lab should send an email of interest to amber.pitt@trincoll.edu. Please indicate why you are interested in working in the Pitt Lab, your major(s), relevant coursework, and anticipated career. Sophomores who are interested in continuing research in the Pitt Lab throughout their time at Trinity are particularly encouraged to apply. Prospective graduate students interested in conducting research with the Pitt Lab should be aware that there is no graduate program in Environmental Science or Biology at Trinity College. However, Dr. Pitt can serve as a graduate student co-advisor or committee member through affiliation agreements with research universities. No longer a student? Postdoctoral researchers and technicians will be considered when funding is available. Opportunities for such positions will be announced on the Pitt Lab website, Trinity College job opportunities webpage, ECOLOG, and other on-line wildlife research and conservation job boards. Urban ponds are often maintained for stormwater catchment, recreation, and aesthetic value, but they may also function as wildlife habitat. Contaminants in urban ponds may threaten wildlife populations if the contaminants decrease reproduction or survival. We are investigating trace metal concentrations and their impacts in urban pond ecosystems to better understand what factors influence trace metal concentrations and overall habitat quality for wildlife in urban ponds. 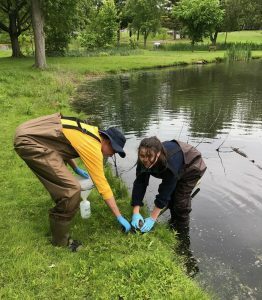 This research will inform urban pond management with the goal of improving wildlife habitat and the recreational and aesthetic value of urban ponds. Eastern hellbenders (Cryptobranchus alleganiensis alleganiensis) are large, long-lived, aquatic salamanders that inhabit high quality, highly oxygenated, fast flowing streams and rivers in the eastern United States. They are sensitive to siltation, sedimentation, and chemical contaminants within streams. Habitat degradation has contributed to precipitous declines in hellbender populations throughout their range to the extent that they are currently being considered for listing as a federally endangered species. Hellbender populations within large portions of the Susquehanna River drainage are poorly studied and research is needed to elucidate their current status. To address that issue, we are working to assess the habitat, distribution, and population status of hellbenders in the Susquehanna River drainage in Pennsylvania. We are employing environmental DNA (eDNA) and traditional survey methods for assessing the current distribution of hellbenders within the drainage. We are using these data along with land use/land cover data to examine relationships between land use and hellbender population and habitat status. This research will 1) reveal the current distribution of hellbenders in an area that has undergone dramatic land use changes, 2) allow for the elucidation of the main drivers of population decline and extirpation, and 3) provide valuable information that can be used to inform management and conservation decisions. Migratory birds have suffered severe population declines and window collisions continue to be a major source of mortality. We are evaluating the number of bird mortality events due to collisions into campus building windows that occur at Bloomsburg University. In addition, we are examining the impact of scavengers on the detection of window collision-based bird mortality events on campus. This research is part of an international effort to assess the effects of college and university campuses on migratory bird populations and is being conducted in collaboration with researchers from an extensive network of colleges and universities throughout North America as part of the larger Ecological Research as Education Network Bird-window Collision Project. In addition to participating in the international, collaborative research project, we are evaluating the effects of Bloomsburg University buildings on migratory bird populations in order to provide data that can lead to making Bloomsburg University buildings more bird-friendly. Key collaborators include Dr. Clay Corbin (Bloomsburg University), Stephen Hager (Augustana College), and Bradley Cosentino (Hobart and William Smith Colleges). Previous undergraduate students who conducted research on this topic include Kira England (B.S.) and Martina Drew (B.S.). Previous student field work participants include Linda Tucker Serniak (M.S. ), Alan Belles(M.S.) , Jamie Shinskie (M.S. ), Kent Cooper (B.S. ), and Gabrielle Byzcek (B.S.). Funding was provided by Bloomsburg University Department of Biological & Allied Health Sciences and an Undergraduate Research, Scholarship, and Creative Activity Grant. Small, isolated, and ephemeral wetlands provide a variety of critical ecological functions but are highly imperiled due to land use alterations and climate change. As a postdoctoral research fellow at Clemson University, I designed and coordinated regional, interdisciplinary, collaborative research projects to map, describe, and elucidate the ecological role of small, isolated, and ephemeral wetlands in the Piedmont and Blue Ridge ecoregions of northwestern South Carolina. This research was designed to collect data that would assist in making scientifically sound wetland management and policy decisions. Key collaborators on these projects included Dr. Robert Baldwin (Clemson University), Dr. Bryan Brown (Virginia Tech), Dr. Alex Chow (Baruch Institute-Clemson University), Dr. Mark Scott (SC Dept. of Natural Resources), Dr. Xubiao Yu (Baruch Institute-Clemson University), Dr. Greg Yarrow (Clemson University), and Dr. John Hains (Clemson University). Former Clemson graduate students who worked on aspects of these projects as part of their degree requirements include Dr. Joanna Howard, Ben Stegenga (M.S. ), Dr. Jun-Jian Wang, and Dr. Dennis Suhre. 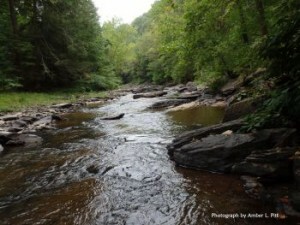 Funding was provided by US EPA Region IV and Sustainable Forestry Initiative grants. Little is known regarding the effects of forest management techniques on amphibian movement, habitat selection, and behavior. As a postdoctoral research fellow at Clemson University, I developed and coordinated research to determine the effects of forest management techniques on American toad (Anaxyrus americanus) movement, habitat selection, behavior, and mortality in a southern Appalachian hardwood forest. This research was designed to collect data that would assist in making scientifically sound forest management decisions. Key collaborators on this project included Joseph Tavano, M.S. (Clemson University), Dr. Robert Baldwin (Clemson University), and Dr. Thomas Waldrop (US Forest Service-Southern Research Station). Funding was provided by the US Forest Service Southern Research Station. Hellbenders (Cryptobranchus alleganiensis) are imperiled throughout their range and the federally endangered Ozark subspecies (C. a. bishopi) is nearing extinction. As a research technician at the Florida Museum of Natural History, University of Florida, my collaborators and I examined habitat status in a stream that historically supported a large Ozark hellbender population in order to document changes that occurred since 1969, provide water quality data for the Saint Louis Zoo’s hellbender captive breeding program, and identify potential reintroduction sites for captive reared Ozark hellbenders. We also collaborated with researchers from Arizona State University, NASA, and the Missouri Department of Conservation to identify the microorganism community associated with Ozark hellbender limb degeneration. This research was designed to collect data that would support Ozark hellbender conservation programs. Key collaborators on these projects included Joseph Tavano, M.S. (Florida Museum of Natural History-University of Florida), Dr. Max Nickerson (Florida Museum of Natural History-University of Florida), Dr. Cheryl Nickerson (Arizona State University), Dr. Mark Ott (NASA), Dr. Jeff Briggler (Missouri Department of Conservation), and Chawna Schuette (St. Louis Zoo). Funding was provided by the Saint Louis Zoo, NASA, and the Reptile and Amphibian Conservation Corps. The extent of the global turtle declines is largely unknown due to the lack of long-term datasets, however experts agree that turtles are highly imperiled throughout the world. As a graduate student at the University of Florida, I examined long-term population trends, assemblage shifts, and habitat changes that occurred in a river since 1969 and determined that a significant decline in a population of northern map turtles (Graptemys geographica) had occurred since 1969, likely due to harvesting. By 2007, the population had recovered, but the recovery period was extensive and the turtle assemblage had shifted and became more generalist-dominated in conjunction with habitat degradation. This research was designed to inform turtle conservation programs and management decisions. Key collaborators on this project included Dr. Max Nickerson (Florida Museum of Natural History-University of Florida) and Joseph Tavano, M.S. (Florida Museum of Natural History-University of Florida). Funding was provided by the Saint Louis Zoo and the Reptile and Amphibian Conservation Corps.